How do I fill out and submit the 1-Week Practice Challenge? 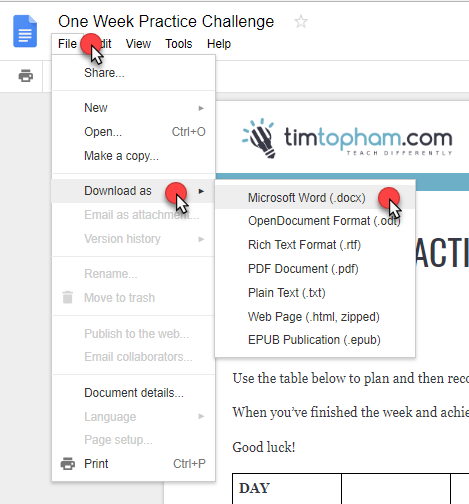 You have 2 options to fill out the One Week Practice Challenge: (1) Open the file using google docs and edit there or on word and (2) Download PDF file, print and fill out manually. 1. 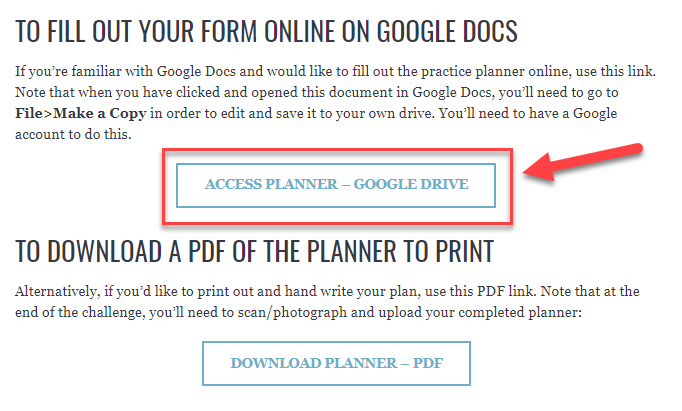 Fill out the form using google docs or word by clicking on the Access Planner - Google Drive button. If you want to edit it using Google docs - Click on File > Make A Copy.. This will open the document on another window that will be editable for you. The file will automatically download on your computer after this and you may now edit it using Microsoft Word. Click the "start my challenge"
At the bottom of the next page is the submission box.